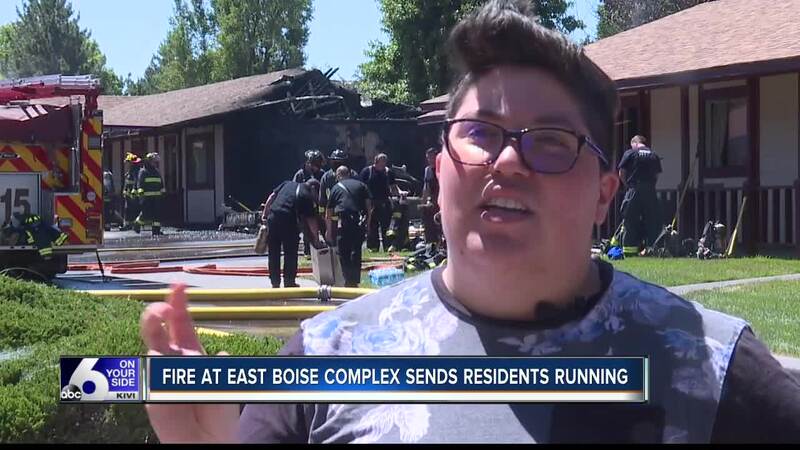 Around noon on Tuesday, Boise Fire Department crews took to the scene of a two-alarm structure fire in the 500 block of West Garfield Street in Boise, near Broadway Avenue. One firefighter was sent to the hospital with a minor leg injury. No other injuries have been reported at this time. Five units-- possibly 6-- were affected by the flames, according to officials. As of 4:16 p.m. Tuesday, the surrounding streets were reopened, Ada County Dispatch officials tell us. No word yet on how or where the fire started, though one resident has a feeling of the cause. Melissa Morales was home with her husband and two children when she noticed that an electrical outlet started to spark. Moments later she saw smoke coming from her roof. At that point, she says she and her husband alerted their neighbors of potential fire and went back inside to find a thick wall of smoke. Fortunately, the family got out moments before their roof collapsed. "I’m sure that we’ll be alright. I'm just really happy that no one was hurt," Morales said. "Having to see how close my kids were to flames is an image you don't really forget, and the jarring emotions associated with that." At least 1 unit and 1 vehicle are reported as destroyed beyond repair.